The Casino was established in 2007 by Operia Corporation Limited Casinos and has since then offered players with a diverse selection of Betsoft’s online Casino games ranging from thrilling poker games to 3D slots. However, the Casino has since been terminated due to concerns of being unresponsive to customer’s complaints. Having been in business for more than a decade, the Casino has undergone major overhauls and improvements to meet the ever-changing needs of the online gambling market. The Casino offers a terrific selection of Betsoft’s slots and games as well as alluring bonuses and in-play promotions. 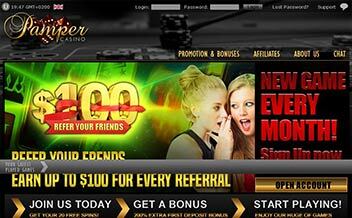 Players at Pamper Casino are regularly pampered with amazing bonuses and promotions throughout their stay. 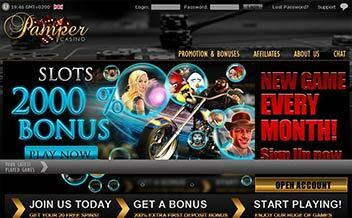 New players enjoy a deposit match up to 225% on all Roulette and Blackjack games. Slot game enthusiasts get a 200% match up to $4000. There is also $100 bonus free chip for new players at the Casino. All these bonuses have a 50 times wagering requirement. The Casino also rewards every player with a $100 bonus chip on their birthday as well as additional bonuses every time you refer someone. Pamper Casino offers players an opportunity to play some of Betsoft’s incredible slot games that are tailored to ensure that players enjoy their time in the Casino regardless of their pocket size. 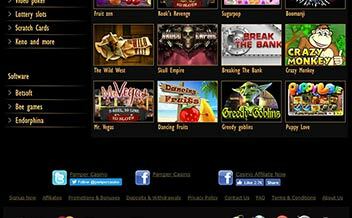 Some of the games available include Mamma Mia, Jackpot Jamba, Viking Age, among others. Table game fans are not left out either in this Casino. The Casino, through its sole developer, Betsoft, provides punters with some of the most enticing table games in the online gaming market. Some of the games made available are Three Card Poker, Pai Gow Poker, and variants of Blackjack and Roulette. Pamper Casino also has some of the best video poker games for poker enthusiasts. The Casino’s section guarantees punters an unmatched experience. Some of the games available include Deuces Wild, Jacks or Better, Bonus Poker, Tens or Better, among others. Pamper Casino’s software is solely powered by the renowned Betsoft which is responsible for all the gaming needs and developments in the Casino. The Casino is designed in a flashy and attractive design with a user-friendly interface that facilitates gameplay. The United Kingdom, the United States, Italy. MasterCard, Skrill, Money Transfer, Bitcoin, Entropay, Skrill, Visa Electron, Money Order. US dollars, Euros, British pounds sterling. 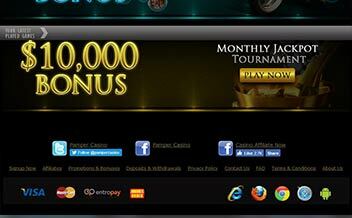 Pamper Casino runs on major web browsers such as Mozilla, Chrome, and Opera. The software is also available for instant play clients which means there is no need to download files to enjoy your favorite games. The Casino has a wide selection of Betsoft’s online Casino games and has one of the most incredible new entrant’s reward program. However, there have been concerns due to numerous cases of unresponsiveness to customer’s complaints.